Sour cream. When I was young, I loooooved sour cream. I liked it so much I could eat it plain straight out of the container. I ate in on my baked potatoes, fried potatoes, and tater tots. The sole purpose of burritos, enchiladas, and tacos was to be able to eat sour cream (and guacamole). I mixed extra into my stroganoff. I dipped everything from chips to apples to carrots to crackers to granola bars in it. I topped fruit salad, soup, and chili with it. I ate it on just about everything. Sour Cream was definitely one of my top ten. It tasted soooo good … but, alas, it was soooo fattening. 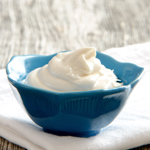 Is There a Healthier Sour Cream? I’ve also tried some vegan versions, but it seems like the ones that taste good were still fattening and the ones that weren’t fattening, tasted just ok.
My friend says this is an inconvenient fact of life. But I disagree. So I set out to find a way to have the same cool, creamy, rich, and, well, fattening taste as full-fat dairy sour cream … without the heart-attack producing, hip-hugging fat. And this is what I came up with. It’s easy to make – takes me about 10 minutes of actual working time – and is very healthy. 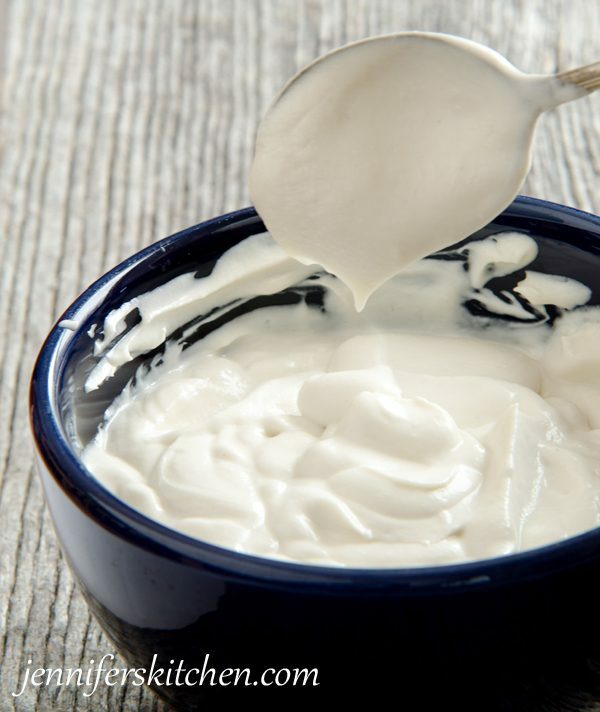 This Soy-Free, Vegan Sour Cream contains about half the calories, half the total fat, and less than half the saturated fat as regular sour cream. It has no cholesterol (regular sour cream has about 15 mg of cholesterol per serving) and it even has some fiber (something sour cream can never claim). Thick, rich, and creamy, but not fattening. Place cashews in a colander and rinse under hot water. Set aside to drain. Place 1 cup water and agar in a small saucepan, cover, and bring to boil. Reduce heat and simmer for one minute. Add agar mixture to blender. Scrape pan out with a rubber spatula to be sure to get all of mixture. Blend until thoroughly mixed. Place mixture in refrigerator to chill for at least two hours. When mixture is thoroughly chilled and set, blend again until smooth and creamy. Return to refrigerator to thicken. Increase oil to 1/4 cup for a richer sour cream that tastes a little bit more like dairy sour cream. I don't recommend making any less than a full recipe; the smaller amount won’t blend well in the blender jar. If you don't need a full recipe (like for these Burritos), just make a full batch and bring the leftovers to me. I'll eat it. Brings back memories of when I was a kid and putting sour cream on bananas with brown sugar. We have gotten so used to being away from dairy, I haven’t even dared envision any more dollops of creamy sour cream. Will be nice to add back in…thanks! Sour cream on bananas? That’s a new one for me. : ) Hmmmm … I may just try that. Great recipe–texture and flavor. I tried to use a hand mixer after the sour cream cooled, however, the blender works the best. Curious if you omit the garlic salt and onion and replace with sugar will this recipe double as a vegan “cool whip”?? Also, what is unscented coconut oil, what brand do you use? I know some are too strong in taste for certain recipes- what do you suggest??? ???? I recently tried this recipe with regular coconut oil and it turned out quite good, so I’ve since adjusted the recipe. I recommend Carrington Farms coconut oil, but there are others on the market that are just as good. Man, these enchiladas look so good, can you tell me how you make them? What brand of enchilada sauce do you use? Did you make the whipped topping recipe? 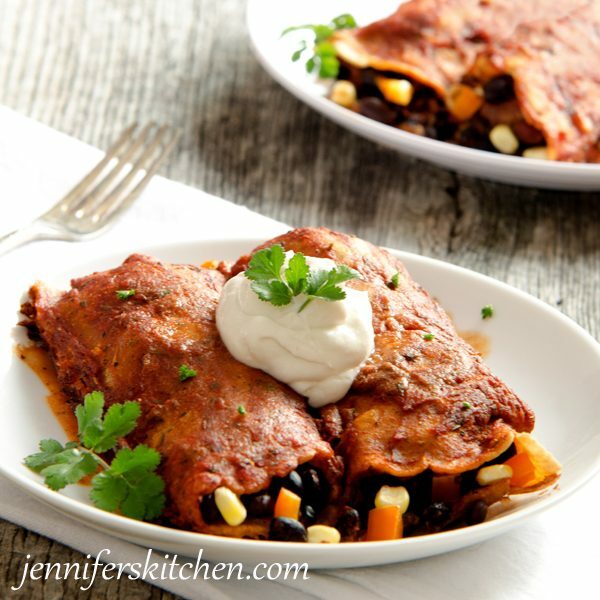 The enchilada recipe will be in our new cookbook! And we’ll have an enchilada sauce recipe included as well! When is it coming out? Will it have pictures for the recipes? I am a visual person and prefer to spend more money on a cookbook that has pictures rather than spend less on one that doesn’t. I notice I use the recipe books with pictures often and the ones without rarely. By seeking a picture of the recipe I can almost taste what it will be like and go forward and make it. Just a thought! Yes! It will have lots of photos! : ) We hope for it to be out in the first half of next year. Great! What will the title be? Will it be gear towards a particular audience or will it be like the recipes on your blog (which I very much like by the way) I know your recipes are mostly geared towards healthy weight loss, I on the other hand am a rare case of wanting to gain some weight. l am vegan and gaining a few lbs for me is so hard (been this way all my life) but thankfully I have found some recipes on your website that works for me and for my family. Thanks a lot! The cookbook will feature recipes that are plant-based and gluten-free with a focus on healthy eating (but not weight loss). 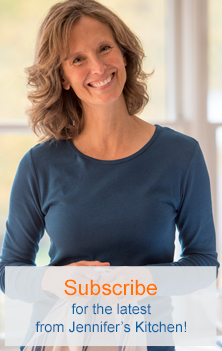 If you are signed up for my updates, you’ll get an email when it’s available. We’re excited! How long will this last in the refrigerator once made? This vegan sour cream will keep for about a week in the refrigerator. Do you recommend soaking the cashews for a few hours before blending/making the cheese? I do not soak the cashews before using them to make this sour cream. Followed this recipe to the T and it never set in the fridge overnight. Very disappointing as it was my only contribution to a party and it was completely liquid. I was unable to contribute either of the dishes I planned to make with it. And although I never missed sour cream before this as a vegan, I now feel a giant sour cream sized dietary hole that I had such high hopes this recipe would fill. Hi Cara, I am so sorry this recipe didn’t work out for you. I’ve made it 40 to 50 times and it always works great and I know many others who have made it and it works for them as well. I’m wondering if maybe your agar wasn’t good. What brand of agar did you use? Did you boil it for 1 minute and then immediately add it to the blender? This is really, really good!! It’s better than any sour cream I’ve ever tried! 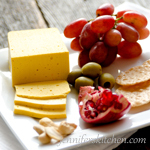 Thank you, Jennifer for this recipe! Love hearing this! Thanks Ava! This was pure perfection! Awesome taste and texture.. it all comes to life after the second blending.. THANKS FOR SHARING!!! Yay – that’s what I love to hear! Thanks for your comment, Natina! This stuff is phenomenal!!! This was my 5th recipe for non dairy sour cream. Others were always way off the mark. But not this. I added an additional tsp of lemon juice at the second mixing and for me, it is perfect! Thank you, thank you, thank you! You have got to try this!! 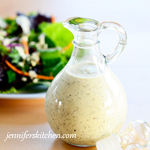 I have tried a couple vegan sour cream recipes and this is my favorite. Can almonds be used in place of cashews? I tried it with blanched almonds and felt it was really lacking. It was edible and it made a decent sauce. But I wouldn’t call it a good vegan sour cream. I am so excited to find a soy free sour cream recipe!! I am definitely going to try it out!! I have been trying to do the Whole 30, but sour cream is so hard to take away from my burritos and I really think soy gives me inflammation. 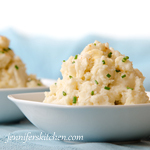 Thank you for posting about this and giving the recipe out and I love that it is from a Jennifer, my name too!! Have you (or anyone reading this) had any luck with a different kind of oil? I’m allergic to coconut and looking for an alternative. One of the purposes of the coconut oil in this recipe is to help the sour cream thicken a bit when it is chilled. I haven’t tried avocado oil in this recipe, but my guess is that it would work well since it solidifies just like coconut oil when chilled. If you don’t think you would like the slight avocado flavor that avocado oil would add to your sour cream, then you could only add half as much oil. This was awesome, though it doesn’t taste anything like dairy sour cream because the onion and garlic flavors are so pronounced. I served it with chili last night and called it cashew cream because I wasn’t going to fool anybody. As yummy as it is, it can stand on its own right. And I used the full 1/4 C coconut oil. In your experience, is there a big difference in texture when using 2 Tb vs. 1/4 C? Also, could you please weight the cashews and get an average weight and add that to the recipe? That would be so great. My other question is how big of a taste difference is it between unrefined and refined coconut oil. I used the neutral stuff yesterday, and it was good. I often use less oil and it’s still very good, but it isn’t as rich and creamy. I’ve tried using different coconut oil in this recipe, but it tastes a little weird using the oil that has a coconut flavor. I’m out of town right now teaching a weight loss class, but I’ll try to weigh the cashews asap.